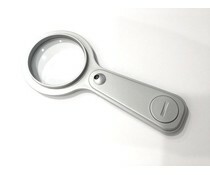 Magnifier Glass with LED light. For easy checking your Stylus. Magnifies enough to see if dust is sticking on or behind your needle. Does NOT magnify enough to check wear or shape.